The mobile phone technology is an important tool to enhance farmers’ access to better paying agricultural markets. The study reports the results of a household study in Mwanza, Dedza and Mzimba Districts of Malawi. The study assesses drivers of adoption of mobile phone technology for agricultural marketing by smallholder farmers. The study used regression techniques to identify drivers and extent of mobile phone use. Results show that use is positively affected by literacy, distance to local market, land size, current value of assets, crop income, and region variations but negatively influenced by access to electricity. Intensity of use is conditioned by gender, participation in agricultural projects, ownership of a mobile phone, current asset value, distance to nearest public phone services, and region variations. Asset endowment plays a critical role in enhancing adoption of mobile phone technology. Gender disparities significantly affect adoption as most women have limited access to assets. The study suggests the need to improve farmers’ access to mobile phones for agricultural marketing. It recommends that government, in collaboration with mobile network operators, should reduce calling tariffs to enhance use, gender disparities in accessing assets should be minimised, and investment in supporting infrastructure must be enhanced. Information and Communication Technology (ICT) is increasingly becoming an important driver of economic growth in developing countries. These tools have become important sources of information in developing countries. Some of the most important ICT tools commonly used as information sources in many sectors of developing country economies include new generation tools such as mobile phones, internet/web-based applications (e.g., e-mails), interactive video and CD-ROM programs as well as the old generation tools namely, the radio and television. The use of these tools enhances information flow among users which enables economic agents to perform economic activities faster by improving access to timely and accurate information (Thompson & Sonka, 1997). Recent studies also suggest that information promotes competition and improves market performance (Katengeza et al., 2011). Access to information increases the level of transparency and trust among transaction partners which in turn improves the level of economic transactions (Kurtenbach & Thompson, 2000). Thus ICT offers the potential to increase the information flow among agricultural actors hence increasing the transparency of agricultural exchange in agrarian economies such as that of Malawi. It can also facilitate knowledge sharing within and among actors in the agricultural sector such as farmers, researchers, extension service providers, traders, and exporters. An increasing number of developing country smallholder farmers have recently embraced the mobile phone technology in order to enhance their access to agricultural markets (Okello et al., 2010). Markets in most developing countries often failed for smallholder farmers who form the majority of agricultural producers (Barrett, 2009). The failure of agricultural markets for smallholder farmers often results from lack of access to information or from the endemic problem of information asymmetry between farmers and buyers (Kydd & Doward, 2004; Poulton et al., 2006). Consequently, majority of smallholder farmers sell their produce in local low-paying markets or at the farm-gate rather than travel to distant better-paying markets (Fafchamps & Hill, 2005). Thus the mobile phone offers smallholder farmers the potential to resolve market failure and increase market participation through access to information on available markets and prevailing market prices. The decision by farmers to adopt a new technology, such as mobile phone, is a choice between traditional and new technology. Theoretically, a farmer will adopt a new technology if it offers greater benefits than the old technology. Farmers’ decision to adopt a technology or otherwise is especially determined by the profitability of using the new technology and risks associated with it (Aloyce et al., 2000). Once a decision to adopt is made, farmers still face another hurdle which is the degree to which the new technology should be used (i.e., the intensity of use). While many smallholder farmers are turning to the use of new generation ICT tools in agricultural transactions, little is known about the factors driving this behaviour. 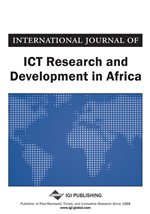 This study therefore uses the double hurdle methods to examine drivers of adoption of new generation ICT tools by smallholder farmers for agricultural marketing purposes in Malawi. In the first hurdle, it assesses the drivers of decision to adopt new generation ICT tools. The second hurdle then examines the conditioners of degree to which smallholder farmers use these tools for agricultural marketing.